Opium Effects: What Happens to the Body and Mind? Opium is the Judas of drugs; it kisses and then betrays. William Rosser Cobbe used this quote by Virgil to describe his 9-year addiction to opium in 1895. This description still applies today. What Are The Short-Term Effects of Opium? In the beginning, opium floods the brain in a way that produces a slow wave of pleasure. Eventually, bodily functions slow down. A person feels sleepy, dreamy, relaxed, and nothing is bothersome. Pain, anxiety, and worry do not penetrate the opium fog. As such, a person feels confusion, moves slowly, and may become so relaxed they fall asleep. Too much opium can cause breathing to stop. When opium wears off, the brain overcompensates for its loss and a person can feel a rebound effect of opposite symptoms. Euphoria and pleasure become depression and feeling lousy. Relaxation and dreaminess become restlessness and inability to sleep. The absence of pain, anxiety, and worry become a pronounced pain, anxiety, and worry. More opium is the only relief. What Are The Long-Term Effects of Opium? As the body develops a tolerance to opium, it needs more of the drug to achieve the feeling of pleasure. So, a person will neglect other areas of life to get higher quantities of opium. When taking more, uncomfortable withdrawal symptoms can occur as soon as a dose wears off. Only taking more relieves the symptoms of feeling sick and lousy, becoming a priority. Withdrawal is not life-threatening, but it is miserable. Sadly, a person can begin experiencing withdrawal after using opium for only a brief time. If the opium dose is high enough, symptoms can come on as soon as a dose wears off. Some effects are watery eyes, runny nose, sweating, and yawning. Over time, the withdrawal progresses to flu-like symptoms with restlessness and irritability. Opium effects and side effects include the quick development of tolerance following feelings of pleasure. The relaxed, pain-free, worry-free high replaced by the opposite creates a dependence on the drug to get rid of withdrawal symptoms. The more opium used, the faster withdrawal symptoms start. For all the negativity surrounding Opium, it has a lot of positive uses too. Opium is the best-known substance for the management of extreme pain. It is also exceptionally good at suppressing all kinds of coughs and as an effective anti-diarrhea treatment. Furthermore, opium has been known to help with insomnia due to its ability to numb senses and relax the body. Opiates, or heroin bind receptors to the brain. This creates feelings of euphoria and bliss. They do this by mimicking the form of a natural neurotransmitter and essentially taking over the brain’s communications, therefore, changing the way the brain sends and receives information. This similarity in structure allows the opiates to go undetected and take over the brain’s operations. As with all drugs, detox is important. This is the case, even more so, with opiates. Due to the strength of opiates as a drug, it is strongly discouraged that you quit alone or that you attempt to quit cold turkey. Even after one small dose of opium, you may begin to experience withdrawal symptoms so understanding how to detox is essential. The more you take opium, the more dangerous and extreme withdrawal symptoms will become. This reinforces the importance of an early detox. Those undergoing opium detox will be given naloxone and suboxone to help ease the withdrawal symptoms and to prevent opium from binding to receptors. After undergoing the detox, patients will be required to attend regular sessions of therapy, individually and in groups. This is to monitor progress and help gradually re-introduce people to everyday life. There is also an option for rapid detox, where a patient is put under anesthesia for 1-2 hours to avoid the effects of withdrawal. During this time, the opium is removed from the brain and spine. This helps to remove physical dependence on opium. However, rapid detox patients will still have to undergo psychological therapy and counseling for the more mental aspects of their addiction. 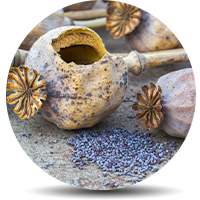 Addiction Resource » Addictive Substances: The Anatomy of Drug Addiction » Opium – Everything You Need or Want To Know About Opium Addiction » Opium Effects: What Happens to the Body and Mind?